I would like to reconcile 2 mental filters with the truth of the energy states I have been experiencing. The mental filters are ‘Twin Flame’ and ‘Red Tantra’. There is a third mental filter as well: Power Over / Powerlessness, which is sometimes known as ‘I’ versus Other. When the energy of the third chakra … the navel point, the will power and ego chakric center … is positive, then the two states feel like this. 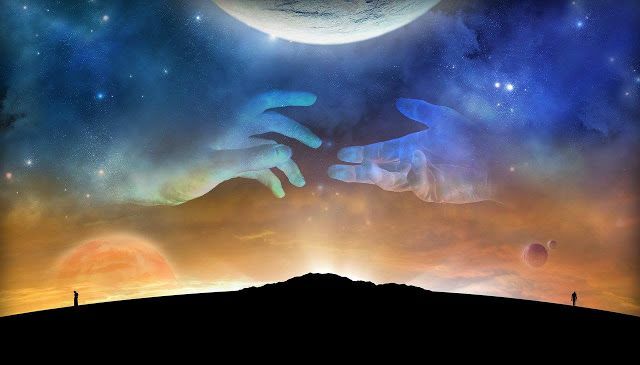 Image: A man’s and a woman’s hand reaching for each other, in the sky: https://s-media-cache-ak0.pinimg.com/736x/5e/91/e0/5e91e0458ce2c5c885f9dfe5dec10ace.jpg ..
See how, in this image, there is a twining and a very close sense of union? Almost as if man and woman were one being? Also, notice how the man looks dominant, unyielding, unconcerned, and the woman looks submissive, lower and smaller, engrossed? Image: The divine couple in Tantric Buddhism (1): Samantabhadra and Samantabhadri: http://www.integralworld.net/images/powers7-10.jpg .. Image: Two curling, touching sparks of golden light, each radiating light outward (2): https://earthenergyreader.files.wordpress.com/2012/05/twin-flame-2.jpg?w=690 .. In this mandala, the orange represents the male red tantric energy, and the green the female. See how the male energy surrounds and contains the female energy? See how the male energy is fiery, and the female energy is cooler? When Power Over and Powerlessness mental filters are also involved, there is a sense of being controlled by another person. Sometimes, hopelessly mired in their snare. 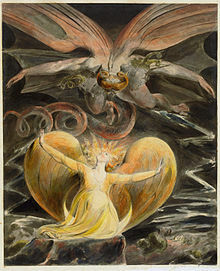 Image: The Great Red Dragon and the Woman Clothed with the Sun, a Biblical illustration by William Blake: https://upload.wikimedia.org/wikipedia/commons/thumb/0/07/William_Blake_003.jpg/220px-William_Blake_003.jpg ..
Then again, sometimes when there is third chakra negative energy, the man can feel hopelessly enmired with an evil woman, as in the movie “Fatal Attraction” with Michael Douglas. Link: “Fatal Attraction” (a 1987 film), in Wikipedia, https://en.wikipedia.org/wiki/Fatal_Attraction .. True power is attained when we overcome the Twin Flame, Red Tantra, and Power Over / Powerlessness mental filters. It is pretty easy to do this by analyzing and practicing with the underlying energy states. Image: Ring Torus *looks like a donut) (4): http://mathworld.wolfram.com/images/eps-gif/RingTorusSolid_700.gif .. Image: Double Torus (looks like a 3D figure ‘8’): http://stanwagon.com/wagon/mathimages/htmlfiles/mathimages_1.gif .. In the case of the Twin Flame mental filter, the person will conceive of himself as standing within one of the loops of the Double Torus, and the woman as standing in the other. He has got her, by Jove! But when a man envisions the Twin Flame mental filter, does he really ‘have her’, as he imagines? No, he does not. What he has is a Double Toroid Energy field. The field is all his, and his alone. He Is That. Red Tantra energy state (akin to electron orbital jump from n=1 1s to n=2 2p): I can’t find a toroid graphic to show what happens for this energy state. But I can draw an analogy from the orbital states of an electron, as it jumps from one energy state (n=1) to an enhanced energy state. 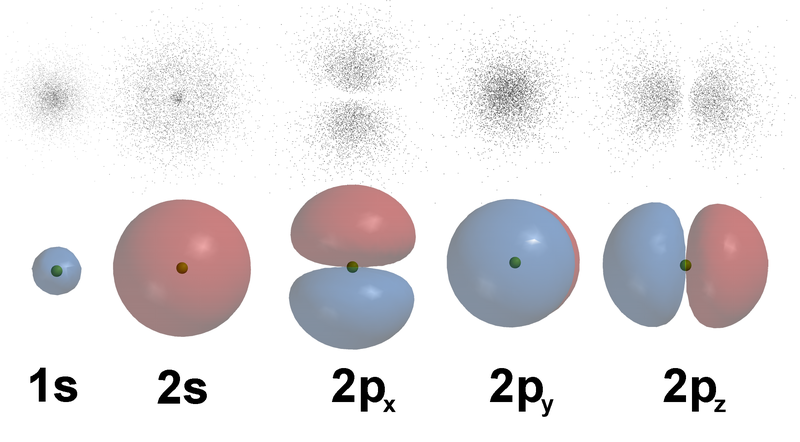 Image: Atomic orbitals for the hydrogen atom, for energy levels n=2 to n=4, from Wikimedia, public domain … Note that for energy level n=2, as shown in this image, there are two configurations: 2s is like 1s, but has twice as much energy in it. 2p is a ‘tantric’ double energy configuration. This n=1 1s electron state is like the normal way a person imagines himself to be. One person. Everything else, everything outside him, is ‘Other’ … vast, threatening, Different. This notion of ‘I’ and ‘Other’ makes a position of Self-Defense seem pretty appropriate. When a photon hits the orbiting electron, the orbit shifts to the first enhanced state, n=2. There are two possible orbits in this state. This first possible orbit, 2p, reminds me of the Double Torus. It is as if this busy electron has become two separate ‘things’, almost. In the Twin Flame mental filter, a person Imagines he is bonded with that which he desires. Where he goes, it goes … which is only natural, considering he Is It. Just as the electron orbit 2p appears to consist of two ‘things’, but Is, in fact, one orbit. From an egoic standpoint, however, the ego feels far less threatened. For here is an ally, a friend forever, someone to fulfill one’s wildest sexual fantasies. Always available, always in love, always eager. What is to fear? So, it is ok to let down one’s guard. Instantly, he experiences a vast increase in his energy field … One that he finds it impossible, with his mental mind, to believe is His Own Energy. But in fact it is. This is the energy state we feel when we let go of fear, and allow ourselves to feel Unconditional Love. The Red Tantra energy state occurs when a person’s energy field collapses, like an n=2 2p electron orbit can collapse into the 2s orbital configuration, which is a sphere within a sphere. But does he really have Her? No. Rather, his energy field shifts, and he imagines a Red Tantra scenario. What happens when he imagines that ‘I’ and ‘Other’ are very intimately one? As with the Twin Flame mental filter, there is a vast increase in his energy field. Just as with that filter, he finds it impossible, with his mental mind, to believe this is His Own Energy. But once again, in fact it is his own energy. He is experiencing a state of Androgeny (5) and Autoeroticism (6) simultaneously … of being both a man and a woman … of activating both hemispheres of his brain … and a sense of sexual arousal that transcends physicality. The New Androgyny takes place when All masculine and All feminine qualities within one’s own Soul come forth in one’s Awareness. The New Autoeroticism is an upwelling of Cellular Love that manifests as ‘I’ making love to All, and vice versa. These qualities manifest naturally as the Ascension process unfolds. This Red Tantra energy state is only the first of many enhanced energy states that can be experienced. So, I would say, let us all fasten our seat belts! The other evening I went to a lecture. Across the room was a man who seemed to be trying, with mind control, to create the Twin Flame energy state with me…. I could feel the Double Toroidal energy state forming … ostensibly ‘between’ me and him … and from what I could see with my third eye, it looked like a Twin Flame energy field was forming, and I could also feel the energy of my field increasing. Then with an act of will and imagination, I pulled my energy field back into the 2s state. Then, just for practice, I moved it out into 2p, and back to 2s, a time or two. Very easy to do, once I realized this was not a Power Over / Powerlessness situation. Rather, it was a chance for me to practice my energy state shifts. Very successfully! This ability to shift the n=2 configuration from 2p to 2s through free will is the hallmark of the yoga master, the practitioner of White Tantra. There is also a Love Triangle mental filter, which flips from the Ring Torus to a Triple Torus. The person imagines he is in one of the open areas of the triple torus. In his imagination, there are two other people in the Triple Torus, one in each of the other holes. The energy zings round from ring to ring, as if Love Itself were flowing from the his Heart, to the Heart of the person in the next ring, and from there to the person in the third ring, and thence back to him. For each of the people in the Love Triangle, there may be an apt Love scenario ostensibly taking place. But what is really happening is that each person is creating his or her own toroidal field. Theirs and theirs alone! Fractally, in 5D, the individual Realities somehow mesh, even though each is separate. In each case, I Am I. Yet I appear to be three! It is the miracle of quantum physics! Image: Triple Torus (three 3D donuts, connected on the sides) (3): http://mathworld.wolfram.com/images/eps-gif/TripleTorus_1000.gif .. But when third chakra energy turns negative, when the Power Over / Powerlessness mental filter enter in, it becomes a great comfort to understand that what we sense …. whether simple torus, double torus, or triple torus, whether n=1, n=2 2p, or n=2 2s … or whatever new energy configurations we may sense in future … and no matter what our minds tell us, each of these energy configurations is simply Our Own Energy. Each of us Is That. I Am I, and I Am the Beloved. This is a great step in awareness. It is the beginning of the understanding that ‘I’ and the ‘All’ Are One. Image: Woman Relating to a Disincarnate Twin as Angelic Self, with an angel on either side of the central vertical power current, which connects the woman and the Angelic Self, and proceeds from Source: https://s-media-cache-ak0.pinimg.com/236x/04/d8/ea/04d8ea1c0041658aa1e6c278515c017b.jpg .. This is why, in the Activations of Light I channel, there is always the phrase Spirit to Team! I relate upward, to my Team in higher dimensions. And from my Team, I request a link to other incarnate Souls’ Teams. The situation here on Earth is so complex, so fractally diverse, involving so many timelines and dimensions, I feel, that it is pure fantasy to believe that I can set things straight through the microscopic spectacles of my Ego. May We Be One with Unconditional Love! (1) from Link: “Twin Souls and the Dangers of Looking,” by Earth Energy Reader, 2 May 2012, https://earthenergyreader.wordpress.com/2012/05/02/twin-souls-and-the-dangers-of-looking/ ..
(2) from Exotic India, Link: “Syllable Mandala with Vajra at the Center,” http://www.exoticindiaart.com/product/paintings/syllable-mandala-with-vajra-at-center-TS95/ ..
(3) from Link: “Wolfram MathWorld,” http://mathworld.wolfram.com/ ..
(4) from Link: “Board Question #66050,” http://theboard.byu.edu/questions/66050/ … I got the idea for this image from Link: “The City of Light and the Hub for ET’s and Then Some!” by Lisa Gawlas, at “The Shift of Energy and Time,” https://lisagawlas.wordpress.com/2015/02/06/the-city-of-light-and-the-hub-for-ets-and-then-some/ ..
(5) Here is the old definition of Androgyny: “Androgynous traits are those that either have no gender value or have some aspects generally attributed to the opposite gender. Physical androgyny (compare intersex), which concerns physical traits, is distinct from behavioral androgyny, which concerns personal and social anomalies in gender, and is also distinct from psychological androgyny, which is a matter of gender identity.” — from Link: “Androgeny,” in Wikipedia, http://en.wikipedia.org/wiki/Androgeny .. However, as stated in the blog, the New Androgyny takes place when All masculine and All feminine qualities within one’s own Soul come forth in one’s Awareness. 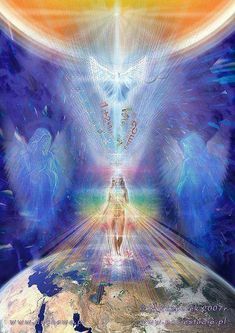 This is a quality that manifests naturally as the Ascension process unfolds. (6) Here’s the old definition of Autoeroticism: “Autoeroticism is the practice of becoming sexually stimulated through internal stimuli. The term was popularized toward the end of the 19th century by British sexologist Havelock Ellis, who defined autoeroticism as ‘the phenomena of spontaneous sexual emotion generated in the absence of an external stimulus proceeding, directly or indirectly, from another person. '” –from Link: “Autoeroticism,” in Wikipedia, http://en.wikipedia.org/wiki/Autoeroticism ..
As stated in the blog, the New Autoeroticism, which takes place as the Ascension process unfolds, is an upwelling of Cellular Love that manifests as ‘I’ making love to ‘All’, and vice versa. This entry was posted in 3rd chakra - navel point, A - My Favorites, Activations of light, Anxiety - fear - panic attacks - fight or flight - cognitive dissonance - mental turmoil, Astrogeophysics - EMF - hologram, Couples tantra - twin flame, Divine Feminine - Divine Mother - Mary Magdalene, Divine Masculine, Electron energy states, Hathors (see also 'All - Law of One - Ra'), Heart clearing - unconditional love, Human torus, Mental filters, Movie reviews by Alice, Power over - powerlessness - service to self - service to others, Quantum physics, Rambles through the brambles, Sacred sexuality, Sexuality, Tantra, Trined tantra - love triangle, Yoga and tagged 2p, 2s, Activations of light, All, all for one, autoeroticism, divine feminine, Divine Masculine, double torus, electron orbit, electron states, fear, Hathors (see also 'All - Law of One - Ra'), I and other, Mental filters, Movie reviews by Alice, my favorites, n=1, n=2, One, one for all, power over, powerlessness, Rambles through the brambles, red tantra, ring torus, sacred sexuality, Syllable Mandala, Tantra, The Great Red Dragon and the Woman Clothed with the Sun, third chakra negative, third chakra positive, triple torus, true power, twin flame, twin soul, unconditional love, white tantra, William Blake on 7 February 2015 by Alice B. Clagett.